A SpaceX Falcon 9 rocket on its launchpad ahead of a successful May 27, 2016 launch of the Thaicom 8 satellite. SpaceX is aiming for an early January return-to-flight launch for Iridium after a Sept. 1 pad explosion. SpaceX is now eyeing early January for its next mission, the first one the company will have launched since a Sept. 1 explosion grounded its fleet of Falcon 9 rockets. SpaceX founder and CEO Elon Musk had previously said the company was targeting mid-December for the return-to-flight mission, which will loft 10 spacecraft for the satellite-communications company Iridium. And Iridium representatives suggested last week that the highly anticipated launch might take place on Dec. 16. But SpaceX needs a bit more time to get everything ready to go, company representatives wrote in an update today (Dec. 7). "We are finalizing the investigation into our Sept. 1 anomaly and are working to complete the final steps necessary to safely and reliably return to flight, now in early January with the launch of Iridium-1," they wrote. "This allows for additional time to close out vehicle preparations and complete extended testing to help ensure the highest possible level of mission assurance prior to launch." The launch will take place from Vandenberg Air Force Base in California. SpaceX's Falcon 9 rocket exploded during a routine prelaunch test on Sept. 1, 2016. A Falcon 9 should return to flight in early January 2017 if all goes according to plan, SpaceX representatives said. The Sept. 1 explosion occurred during a routine test ahead of the planned launch of the AMOS-6 communications satellite from Cape Canaveral Air Force Station in Florida. That explosion destroyed the two-stage Falcon 9 and the $200 million satellite. SpaceX has traced the anomaly to the interaction between oxygen and a carbon-composite helium container in the rocket's upper stage. 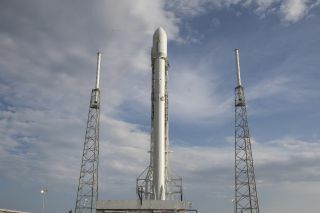 But the company still needs to finish its anomaly report, and have the U.S. Federal Aviation Administration sign off on the findings, before returning the Falcon 9 to flight. SpaceX has dealt with such setbacks before. In June 2015, a Falcon 9 broke apart less than 3 minutes after lifting off from Cape Canaveral. The mishap scuttled an uncrewed cargo mission SpaceX was flying to the International Space Station for NASA. A faulty steel strut in the Falcon 9's upper stage caused that accident, Musk has said. An upgraded version of the rocket returned to flight six months later, successfully launching 11 satellites for the company Orbcomm. The Falcon 9's first stage returned for a landing at Cape Canaveral during that December 2015 mission, marking the first time a rocket ever achieved a soft landing during an orbital launch. SpaceX has since landed five other Falcon 9 first stages, and the company has said it plans to re-fly one of these rockets soon. These activities are part of the company's effort to develop reusable rockets, which Musk has said could slash the cost of spaceflight and help open the heavens to exploration.